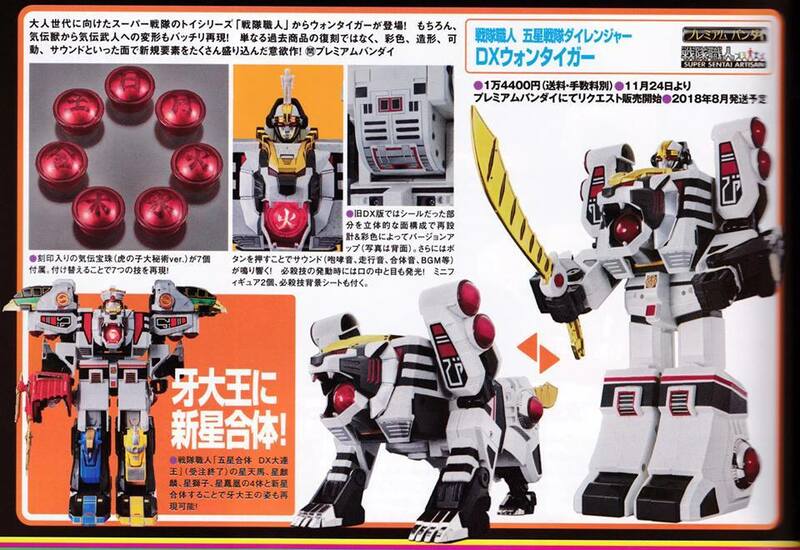 Following the Super Sentai Artisan Dairen'oh, Bandai has finally Super Sentai Artisan DX Won Tiger revealed in Figure oh. Will cost 14,400 yen and include 7 Legendary Chi Treasure Pearls which can be swappable. So are they swappable or do you have to persuade them? "Buy me a drink first." Will it have the lights and sounds feauture from the original? My favorite toy from my childhood DX Won Tiger this will be much better with paint and not stickers. This toy is like a masterpiece to me I just so glad to have this toy again from my childhood it so much nicer looking with lights and sounds this is how you make a cool Sentai mecha not that piece of crap legacy one ugh lol. I'm going to have to disagree. Lights and sounds are the only thing this one has over the legacy tigerzord. The legacy version is better in pretty much every other respect. It's proportions are more show accurate. 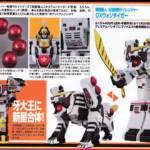 A majority of the details on the SSA version are tampos, while they're molded onto the legacy. The chrome is also less accurate, as it was metalic on the show. You can like this one all you want, but to say the legacy version is crap is just silly. I disagree the legacy is lame and it much smaller than the DX which is why I don't like it. Also the tiger mouth lights up in the show the legacy does not have that so it not all that accurate. The details on SSA are paint on not tampos the SSA Daireoh is also painted same treatment. I have the legacy and it crap I be getting rid of it so I can get a much better DX Won Tiger. If you don't like the SSA Won Tiger understandable but I do and I happy take this over the legacy. I really want BOJ to release some pre Power Ranger Robots. I'm fine with my legacy ones. If it were SoC then maybe, but this is just over glorified kids toys. It's the original molds with extra playability, and paint instead of stickers. Not worth the money in my honest opinion. Live Robo and Live Boxer next year perhaps? It will be the 30th anniversary next year for Liveman.